FILE - Libya Dawn fighters search for Islamic State militant positions during a patrol near Sirte. U.S. officials are pushing a select group of allies to expand their sights beyond Iraq and Syria in the global effort to destroy the Islamic State (IS) terror group. Spurred on by IS's growing strength in Libya as well as the deadly terror attacks in Paris this past November, U.S. officials see a clear need for a broader, more comprehensive approach. "They have talked about it," a Western diplomat told VOA on condition of anonymity. "There are discussions on their side." Those discussions have become more urgent as intelligence shows an increasing number of IS fighters and recruits making their way to Libya from across North Africa, parts of east Africa and the Sahel. Already, Libya is home to what U.S. intelligence officials consider IS's most lethal affiliate, with an estimated 5,000 fighters, steadily expanding from the group's stronghold in the town of Sirte. This past Monday, an estimated 50 IS militants launched an attack in Ben Guerdan, along the Libyan-Tunisian border, killing 55 people. Top U.S. military officials have identified Britain, France, Italy, Germany and Spain as key partners in the fight against IS in Libya. FILE - Civilians and security personnel stand at the scene of an explosion at a police station in Tripoli, Libya, a blast later claimed by militants professing loyalty to Islamic State, March 12, 2015. "We, as part of that international community, have to do more," the Africa Command commander, Army Gen. David Rodriguez, warned the Senate Armed Services Committee on Tuesday. "The international community has to take action to halt the expansion, degrade it and eventually defeat it," he added. But those with knowledge of the U.S. discussions about a broader coalition strategy caution they have yet to coalesce into any concrete proposals. "Our government's extremely concerned about the growing extremist threat in Libya," said a Western official whose government is "working closely" with the U.S. The official added that, despite a desire to develop a comprehensive approach, it is "a little too early to say what the support might look like." "It's clear a number of states are now actively working to counter ISIL in coordination outside of Iraq and Syria," said Daveed Gartenstein-Ross, a senior fellow at the Foundation for the Defense of Democracies. ISIL is an acronym for Islamic State. "But how big a coalition, how sustained it will be is the question," he said. For now, it seems Washington is counting on a consensus on the need to fight IS wherever it tries to take hold to keep pushing a broader effort forward. FILE - A man loyal to the Libyan armed forces prepares himself for clashes with Islamic State group militants west of Benghazi, March 7, 2016. "I see a common view," chief White House Counterterrorism Adviser Lisa Monaco told an audience at the Council on Foreign Relations in Washington this past week. "There's a recognition that ISIL poses a distinct threat to European countries." But gaining support for any proposal may prove difficult. "Our forces are completely stretched," said the Western diplomat, who spoke to VOA on condition of anonymity. "It's difficult now for us to intervene more." There also appear to be differences on timing. While the U.S., Britain, Italy and France all have forces in Libya, their roles have been limited. The U.S., in particular, has confined its special forces to looking for partners on the ground once a unity government is established. The concern is that use of military force before a Government of National Accord is firmly in place could undermine the country's political transition. Yet the process has been dragging on, and some U.S. officials, including CIA Director John Brennan, have warned against waiting too long. "You cannot put off the kind of terrorism operations as this long process of government building continues to take place," Brennan told lawmakers late last month. Finding partners is also problematic. 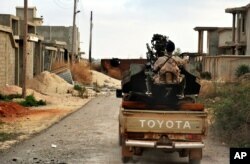 "There is no group on the ground currently that cares enough about ISIS in Sirte or has that effort up high enough on its priority list to actually hit ISIS in its core terrain," said Harleen Gambhir, a counterterrorism analyst at the Institute for the Study of War, using another acronym for Islamic State. Others fear too much time has already gone by for a coalition of U.S. and European countries to halt IS's expansion. "This might be too little too late," said Michael Horowitz of the Levantine Group. "ISIS has been able to largely expand to North Africa and south of it, using its Libyan colonies both as an entry point for its militants and as a magnet for local militants already operating inside the African continent," he said. Others see another potential problem: The use of military force, however coordinated it may be, can still backfire. "The concern is that implementing counterterrorism tactics in order to fight this group will not actually defeat it and might make it more resilient," said American Enterprise Institute Research Fellow Katherine Zimmerman. "We've seen this happen with al-Qaida globally, where airstrikes have certainly degraded the leadership but the groups themselves have become more resilient in terms of regenerating their capabilities," she said. "ISIS is likely able to do the same."